Characteristics such as temperament, physical ability and size distinguish a number of dog breeds as suitable for service animal work. While golden retrievers are one popular choice for people who need dogs to retrieve large items or help with mobility, Yorkies have additional advantages that make them a better match for some disabilities. Having a Yorkie as a service animal has many size-related advantages, not the least of which is that they fall within the strict limitations of rental apartments' pet policies. Apartments typically have weight restrictions of up to 25 pounds, while private landlords who are on the fence about allowing pets at all may be more inclined to consider a small dog. Service dogs perform myriad functions that make everyday life easier for people with various disabilities. 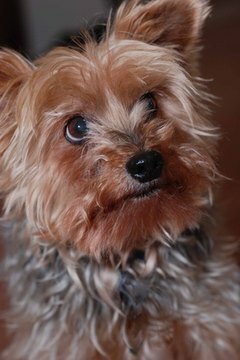 Yorkies are especially valuable as medical alert service animals because they can be trained to detect epileptic seizures and subtle changes in a diabetic's glucose level. Yorkies are also valuable psychiatric service dogs, because their portability allows them to accompany their caregivers almost anywhere, which, according to the Psychiatric Service Dog Society, is a critical component of managing mental health symptoms. Even though the Americans with Disabilities Act (ADA) states that service animals cannot be refused access to public transportation no matter their size, a Yorkie's small stature makes traveling with it more manageable than traveling with, for example, a golden retriever. By the same token, lap duty is also a special task reserved for the tinier service animals, which provides caregivers the opportunity to physically embrace their canine companions rather than having just the dog's head resting on their laps. While small, Yorkies are adept at helping around the house with easier projects such as pulling open cabinet doors equipped with soft handles; fetching the television remote; retrieving clean clothes from the dryer; and alerting their owners to the phone, the doorbell or a crying baby. In an article for the journal "Interventions," Debi Davis proudly boasts that her service Yorkie enjoys pressing the automatic door remote with her nose and helping to change bed linens by tugging at the corners.